The reports have already created waves of familiar panic in our Chicago office -- and likely to our members as well in cold-weather places. 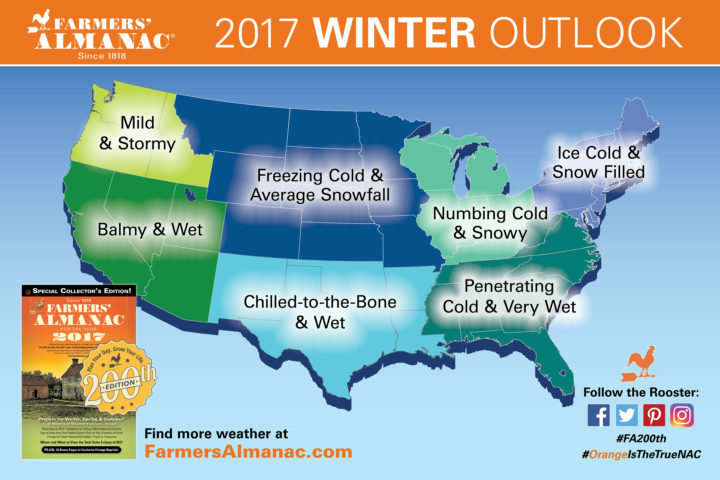 The Farmers' Almanac just released its 2017 winter outlook, and it's a very chilly snapshot. This has really motivated our Deal Experts across North America to start looking for early-bird warm weather deals for our members. (OK, OK, and for us to take as well.) This is good news, however, for skiers in the East; the Farmers' Almanac does contain a forecast that should keep them happy. According to the editors of The Almanac: "(The book), which bases its long-range forecasts on an almost 200 century-old formula, forewarns of a colder-than-normal winter for two-thirds of the nation. The exceptionally cold conditions will be most prevalent over the Northern Plains, Great Lakes, Midwest, Ohio Valley, Middle Atlantic, Northeast, and New England states. The West however, seems to be spared any extreme cold this winter, with the Almanac predicting milder than normal conditions for many western states." The report predicts the coldest month will be February, so avoid booking your trip around Valentine's Day or Presidents Day to get the best savings. Don't sleep on a great price. If something looks good, book it! The only way to make this forecast more bitter is to know you missed on the chance to sunbathe in San Juan or island hop in Hawaii. Consider all-inclusive resorts. It's not uncommon for vacation packagers to work with these Mexico and Caribbean resorts early to help their winter occupancy rates. These places are often big enough to put a certain number of rooms aside for early-bird deals. Start your year out by using some vacation days. The best hotel rates are typically found during week days. It's never too early to book a cruise. These itineraries are set far in advance and smart shoppers know deals here aren't too hard to find given the competition in the field. Use Travelzoo's new hotel search: Tell us when and where you want to go, and we'll show you all the great hotels and deals available on your dates. Later this fall, start reviewing Today's Best Fares, which shows the best airfare in the market for the next 90 days. Hilary Solan a deal expert at Travelzoo and based in Chicago. Travelzoo has 250 deal experts from around the world who rigorously research, evaluate and test thousands of deals to find those with true value.